This entry was posted on August 28, 2010 at 7:16 am and is filed under Dreams, Family, Friends, Life, Musings, Personal, POETRY, Random, Reflections. You can follow any responses to this entry through the RSS 2.0 feed. You can leave a response, or trackback from your own site. There is freedom yes Tracy…and that is indeed wonderful. Thanks for your comments. Very good writing, love the picture, red is also my favourite colour. 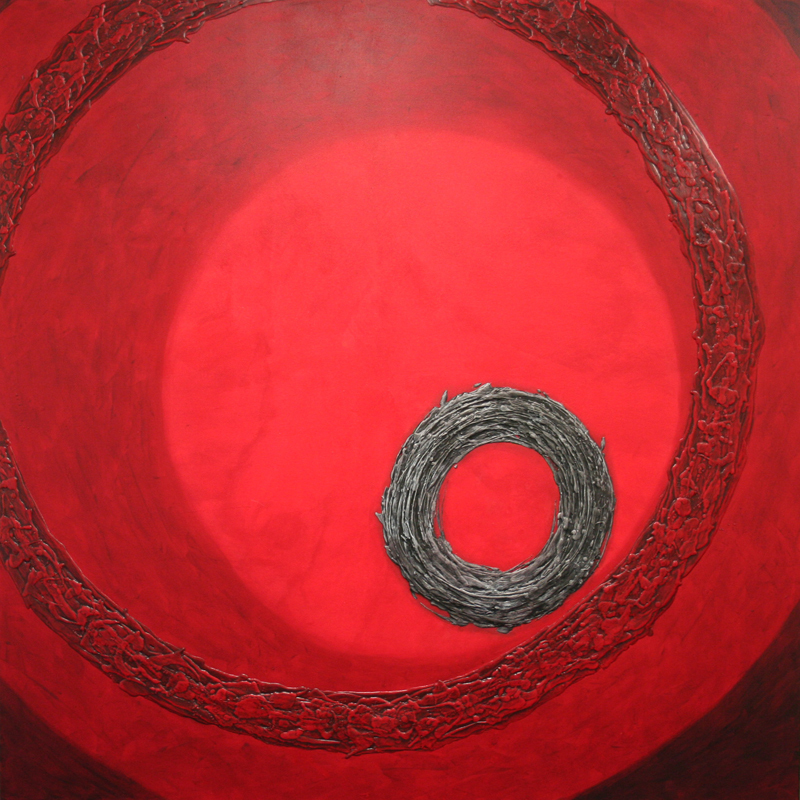 Love the circles theme, and the depth perspective in the painting, red of course – it had to be red. And the title fits it nicely. Freedom whispers… it does. Amanda, this is a beautiful painting… I love it and knew that it would be red and the poem is so lovely and descriptive of your new-found creative ability! That’s a cute poem. Are you a painter? What a beautiful poem about color, you are simply the most colorful poet around. Funny how you posted that video on Pink Floyd and Kavita was thinking about it and I was thinking about doing a poem about color and here I see your beautiful creation. Magical you are. Have a red- a luscious week end. Very nice, Amanda. I particularly like the way in which you have ended with the title once again. Sorry, my mistake, I see you have called the piece ‘Unity’. This is beautifully rendered! I love the bird imagery: immediately sets a fanciful, free tone! ‘the dancing rain on my fingertips’ – what a lovely expression Amanda. You always have such compelling photos to accompany your work, buttercup. Not that your work needs it, but they’re an interesting addition. Makes me want to paint (again). Isn’t it rewarding to receive Cin’s recognition? Because we share the honour and category of Cin’s award, I have swung by your blog and am delighting in your offerings. I look forward to following your posts. I had to smile at your photo of icicles. Having grown up with them decorating our eaves, I am delighted to be reminded of the artistic value they hold. thnks for the share..I loved this! The freedom of sacred space. Nice work, Amanda … lovely artwork too. And topped with Pink Floyd … kinda like a cherry on a sundae. Hugs … Happy … Sunday night???? ?